Whenever I see a film that was written and directed by the same person, I’m always a bit leery. It seldom works. Sometimes, however, magic is created. Some of the better examples of successful writer/director films are Titanic, Risky Business, Shawshank Redemption, Fargo, and Jerry Maguire (note that two of these films star Tom Cruise). 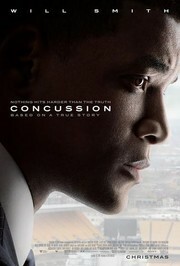 You can now add to this list Concussion. This is a superb film from beginning to end. It’s one of those rare films where every aspect of the film is first rate: acting, writing, editing, soundtrack and directing. I now see why so many people were angered that Will Smith did not get a best actor nomination. He should have been. He was totally convincing in the role. And so too were the other actors: Alec Baldwin, Gugu Mbatha-Raw, David Morse, and Albert Brooks. This film proves that sometimes the guy who has the vision is also the best person to guide it through the filmmaking process. This film has been on my “to watch list” for a while. I wanted to make sure that I saw all the Oscar nominated films and performances first. The reviews for this film have been mixed, so I put it on the back burner. I don’t get it. Films don’t get any better than this. It starts with a compelling story. Bennet Omalu is a pathologist who is given the task of doing an autopsy on Mike Webster, a former Pittsburgh Steeler football player who committed suicide. When Omalu is unable to determine why a fifty-year-old football player would take such drastic measures, he decides to take a closer look at Webster’s brain. That’s when he discovers the abnormality that is only detectable after death. From there it is a one-man fight against the most popular sport in America. And while writer/director Peter Landesman has taken a side in this particular story, he is also careful to present arguments for trying to find a workable solution by showcasing the thrill and grace of football. The film is so well done that even though you’ve seen these same actors in countless other roles, and often in less serious circumstances, you feel as though you’re watching something unfold in real time. Add to this a story that has significance and you have a film that needs to be on your “must see” list.